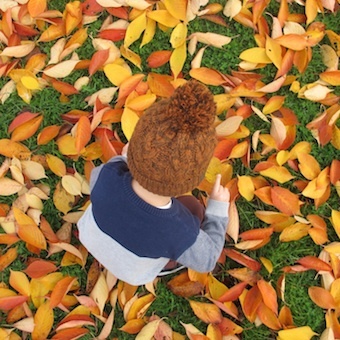 Everywhere you turn is ablaze with rich autumnal colour right now and little brother just can’t get enough of it. He’s been waiting patiently, admiring the myriad colours from below. But now the leaves are finally falling he spends most of the walk home from school gathering up fistfuls of the brightest yellows and oranges that he can find. Once we get them home I press them between the pages of a heavy book for a few hours to make them easier to handle. He loves creating pictures with the different shapes and colours. He is obsessed with Lions at the moment so, naturally, the first thing he wanted to make was a Leaf Lion. He was totally captivated by the first attempt and kept reassuring me that “it’s a friendly lion”. Stick the leaves onto a large sheet of paper in the desired crown shape. I found Pritt Stick to be the most effective glue. Once dry, cut out the shape and attach to a chosen headpiece with a few small staples. I used a sun visor turned upside down but I appreciate that I may be the only person in England who actually had one lying around in the bottom of the fancy dress box. A strip of card around the head would probably work just as well.